An organic backyard chicken farmer was processing ten chickens for sale. 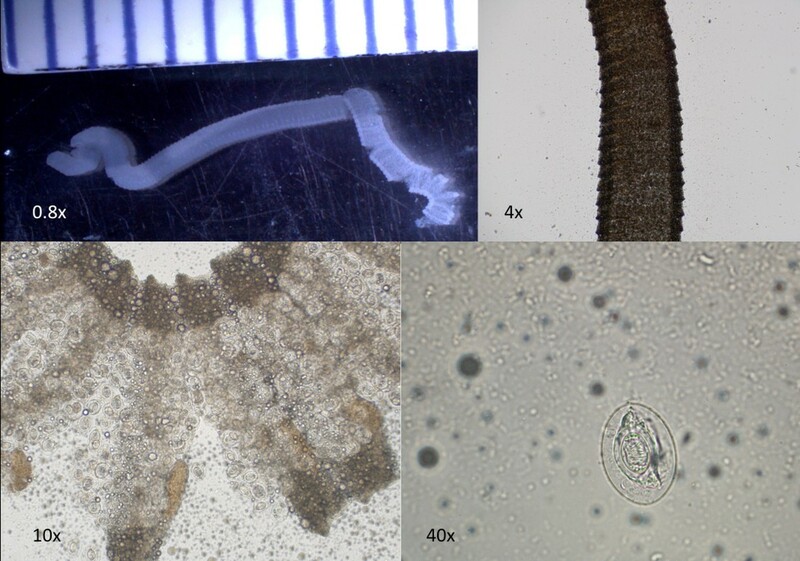 In two of the chickens, several parasites seen in the upper left panel of the picture below were observed in the small intestine and were submitted for identification to the state diagnostic laboratory. The organisms were observed beneath a dissecting microscope (upper right), and were noted to be segmented. One of the segments was removed and crushed in saline on a glass slide, over which a glass coverslip was placed. Numerous smooth-shelled eggs were seen that were roughly 45–50 um in size (lower left), and at closer magnification, hexacanth embryos were present within the eggs (lower right). These are Raillietina sp. tapeworms. Most Raillietina spp. require a specific intermediate host such as a beetle or ant and require a wild or domestic bird as a definitive host. Infection with Raillietina species can cause nodules, enteritis, and emaciation in poultry. Diagnosis often through the identification of gravid proglottids passed in feces. ​Many thanks to Katie Huffman, 4th year veterinary student at Virginia Tech who provided the clinical case scenario and photographs.